If you’ve found yourself in a pinch, you may have considered a payday loan. If you’ve never gotten one, stay far away from payday lenders! 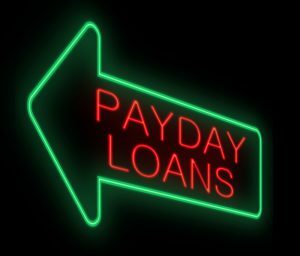 The Consumer Financial Protection Bureau reports that more than 80% of payday loans get rolled over into or followed up with a new loan within two weeks of the initial payday loan. Often, these loans set off a chain reaction—half of them are in a sequence that’s at least 10 loans long. 10 loans long. This means that two things are true—the borrower can’t afford their own lifestyle, and they also can’t afford to repay the payday loan. Why Consider a Payday Loan in the First Place? Most people using this kind of loan aren’t getting these loans to pay for an emergency or a special purchase. Nearly ¾ of borrowers with payday loans took them out to pay for recurring expenses like debt payments. Now, there are a lot of reasons that a person may not be able to make their recurring payments — a loss of a job, a health situation, a decrease in household income — it’s not a moral problem. Good people fall into difficult circumstances all the time. The payday lenders are predators. Remember the children’s book, “If You Give a Mouse a Cookie”? The predators are a lot like the mouse. They offer a seemingly easy way out of today’s problem by offering you a much worse problem tomorrow. They keep coming back for more of your money. Many payday loans come with terms of just a few weeks, plus they carry alarming annual interest rates of up to 300 percent or more. Additionally, most will have high startup fees and aggressive due dates. These features can add substantially to their total cost. Borrowers who fall behind on their payments or suffer unexpected setbacks like job loss can quickly become overwhelmed by this debt burden. If you struggle with high credit card debt and a meager income, you’re probably looking for ways to bolster your finances. Many consumers who deal with similar problems turn to payday lenders for access to short-term capital. Unfortunately, as the saying goes, if it seems too easy maybe it’s too good to be true. Taking a payday loan can have unintended and often severe consequences putting you in an even worse place from where you were when you took the loan. Trust your gut that you can weather this financial storm. The worst time to make such a decision is when you feel there is no other way out. Call one of our counselors. Let us help by giving you practical advice. In the meantime, don’t sell yourself short – payday loans are never a good thing to do, no matter how you try to swing it. Why not start turning things around with helpful tips from our debt management articles? And if it’s credit card debt or other unsecured debt that keeps you up at night, CreditGUARD’s certified credit counselors can work with your creditors to reduce your rate and stop harassing calls. Give us a call today at 1-800-500-6489.